I received a notification from Wordress.com. My domain momiberlin.com renews on April. That means Momi Berlin is one year already by next month. I started my blog more like an online diary mainly to keep track of my boys’ achievements and anecdotes in a rather modern way. Never did it occur to me that people will read it, and possibly, inspire them too. I only have my love for writing as a tool. And I rely on my little knowledge in writing a composition to give particular emphasis to what I would like to drive at. I just write in a way that comes naturally. Until I got invitations to events and product reviews. I learned of different blogging communities, each presenting various opportunities. The chance for an opinion to be heard is big. Being referred to as an influencer is overwhelming. I never thought I could affect the purchasing decision of others in some way significant or authoritative. This led me to give time to learn and improve Momi Berlin. Very timely that as I attend blogging events and join blogging communities, I meet and befriend generous people. They advised improving my blogging further. They also urged me to use blogging tools to pull in my target audience and attract marketing strategists to come to my site. Though time is precious, they even traveled to meet and teach me what they know. They are that big-hearted. Some of these kind souls are Vance of Purple Plum Fairy and Robert of Amazing Life Daily. They both mentioned to me about Search Engine Optimization or more commonly known as SEO. 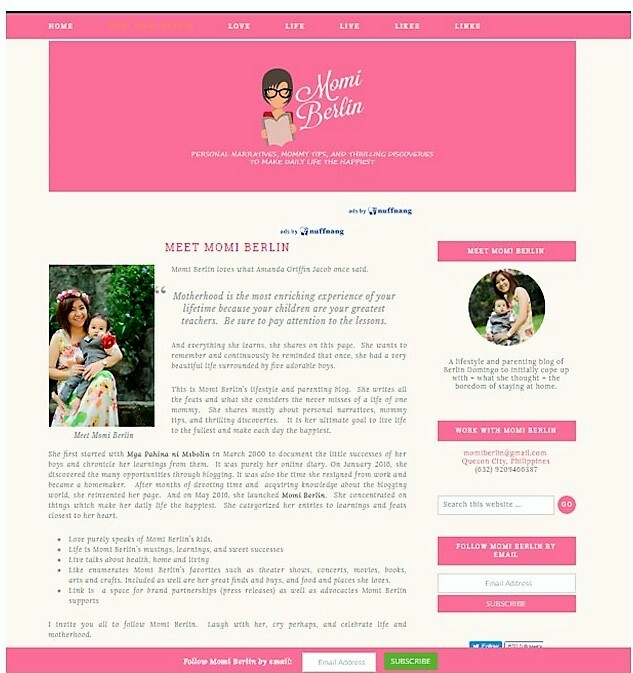 A month after securing a domain name for Momi Berlin, I also looked for a web hosting company. This was another crucial decision as I need a reliable company to ensure that my website remains accessible all year round. I have come to know that I need to rank high in search results for brands and consumers to easily find me. A site which is always down and slow would hurt my rankings. After checking a few sites, I decided to contact CoffeeMags to host Momi Berlin. CoffeeMags has been very patient with me. They helped me set up and recommended the plug-ins they believe I need on my quest. The entire look of Momi Berlin is through the generous help of a dear friend’s cousin. He studied web design and poured his expertise to create the look we would like Momi Berlin to project. Such a dedicated individual, he even spent nights to help me. He is that patient. And though I am many years older than him, he was able to explain to me in the simplest ways my funny questions. He now lives in the states yet he still accommodates my requests from time to time. And as usual, he always finds time. As I look for a platform to write my thoughts, I came across WordPress. It was 2009. I find it easy to use. I also love its wide selection of themes to create the look I would like to project. WordPress has a variety of free as well as premium plug-ins that are easy to understand. I need not be a web developer to learn how to code or develop those excellent features to make my blog equally impressive. Today, besides blogging, other businesses are also using WordPress to run their websites. The fact that it is the most loved and used blogging platform on over 70 million sites makes WordPress a perfect choice. 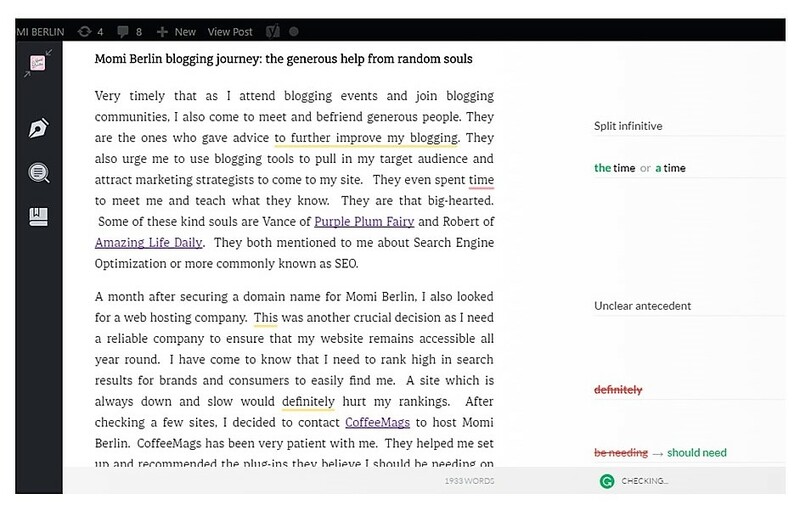 Beginners and pros alike can easily navigate and understand its built-in blogging features. The mere fact that WordPress makes me comfortable led me to decide to get my domain from them as well. Yoast SEO is a WordPress plug-in. It is designed to improve traffic on the blog post especially that I am still establishing my audience. This plug-in takes care of setting up the meta titles and descriptions. The meta description is a brief yet comprehensive preview or snippet about a blog post. This is commonly used in search engine result pages and works together with the keyword. The keyword is the particular word or phrase one types in Google, Bing or other search engines. The goal is for the keyword to be easily searchable to get more traffic to the blog. Because once they have seen Momi Berlin on the results, they can enter my site and thus increase traffic. Another function that I love about Yoast SEO is its readability analysis feature. Just like in any copy, readability is important. It is always the goal of the writer not just to produce an informative or timely article but to be understood easily. A difficult write up may drive away a potential reader which in turn will lead to a lower ranking. The readability analysis then aims to make the copy easy to read, well-written, and concise. To guide any writer, Yoast SEO has the Flesch reading ease score. This score simply tells one how easy or difficult to understand the copy is. A high score means the text is easy to comprehend. And to score high, one needs to consider the length of the sentence and even the number of syllables per word. Simply put, short sentences and no words of more than two syllables get a high score. Months of using Yoast SEO help me be mindful of my sentence construction. Yoast SEO supports the passive voice analysis thus it flags passive verbs in my writing. In our English class, we were told by our teacher that a passive voice is considered a weak word thus should be avoided. I also come to understand through this plug-in the importance of writing short sentences. Before, I would write long ones as I find it difficult to divide the sentence into two. Then I learned that short sentences are easier to read. A short sentence contains not more than 20 words. Aside from that, I am less likely to commit a mistake in grammar if my sentences are concise. It may be perhaps in our 5th grade that our English teacher taught us about transition words. I honestly did not give much notice to it until I started blogging. I learned that transition words guide readers to connect one sentence to another. It is necessary then to use them to give direction to the readers. Examples would be the use of ‘and’ to show I am summarizing my points; ‘less than’ to emphasize comparison; and ‘thus’ or ‘hence’ to signify my conclusion. Madz, a mommy blogger friend, recommended that I use a plug-in to protect my site’s content from theft. 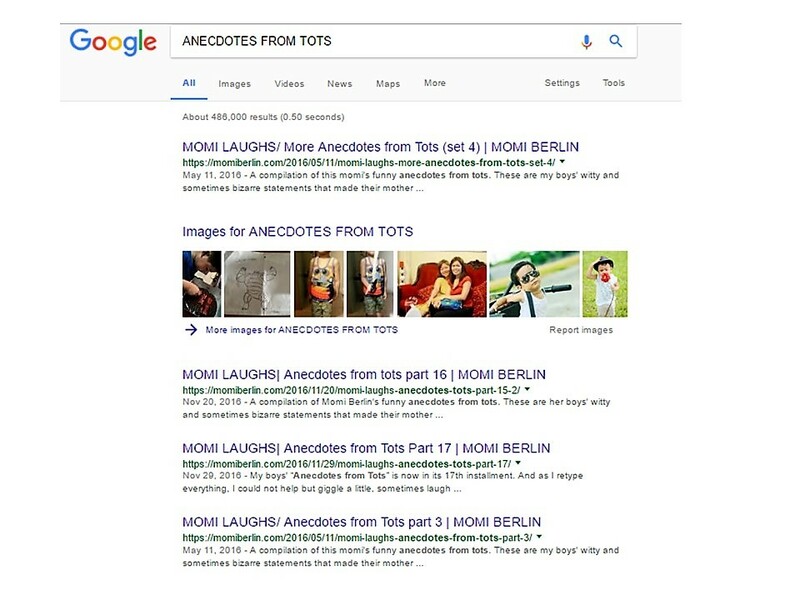 Sadly, there are those who would download images and text from Momi Berlin, upload and claim them using their name. Through the WordPress Plugin Directory, I was able to download Copyproof Website. After activation, my whole site is now copy-proof. Again, this plug-in is free and has amazing features like disabling mouse dragging to copy text or right click to save an image. And if anyone takes a screenshot, he will get a 72 dpi and not the usual 300. He cannot also use Ctrl+ functions to save, copy or paste any of my work. This post aims not to encourage you to take up blogging as a serious career. I just like to share with you how a simple intention to write led me to find the purpose I have been looking for all along. I am not a big time social media influencer. But I have Momi Berlin to put in my two cents worth. When I started blogging nearly a year ago, making money was the furthest thing on my mind. Blogging is more of a hobby until it becomes my baby. Months after months, opportunities came and continuously come. Sponsored posts come knocking on my door. Brands are offering to pay for the copy I would create for them in exchange for a few dollars. Copies are usually about product reviews and certain services. Blogging events are aplenty especially if a blogger grabs one after another. Bloggers receive cash compensation or transportation allowance or perhaps tokens. Most of the bloggers I know are very active in this kind of opportunity. I, on the other hand, select events I would want to attend to as I have a house to manage and a family to take care. Also, I have a particular niche I love to write. And that is parenting. Through blogging, I was able to create my circle of trusted friends. In our group, we tip each other of blogging events. If one got a sponsored post or product review, we try our best to recommend others for the same opportunity. We also share newly acquired knowledge to improve our websites. I also got to connect with other bloggers who write for a living. These connections led me to more opportunities. A blogger friend encouraged me to apply in an online magazine. I got accepted and now write for them regularly. Every peso I earn is dependent on the time and effort I exerted. I am paid per article I wrote, and additional payment is given depending on the page views of each story. What perhaps I love best about writing gigs is that I receive not only my hard earned money but also the exposure. Exposure, for me, is priceless and would help boost my writing skills as well as somehow help me create a name in the industry. Another positive effect blogging gives me is that it becomes my resume. Once in a while, I get freelancing work because others read my blog post. They would get me to write for them or refer me to write for a company. These opportunities do not happen overnight. A good writing skill certainly gives one opportunities as this becomes her foundation. Being a good writer pays off as it is the basis or groundwork of her career. However, there are other factors that all the more boost one’s chances of earning, that is if her goal to blog is to earn. One needs blogging tools. These will help her come up with brighter ideas, guide her to write efficiently, and most importantly, get her post seen by more readers and eventually, brands. Do not dismiss the fact that there are generous individuals as well who are more than willing to help reach her goal. Keep them within your reach and be sure to pay forward. 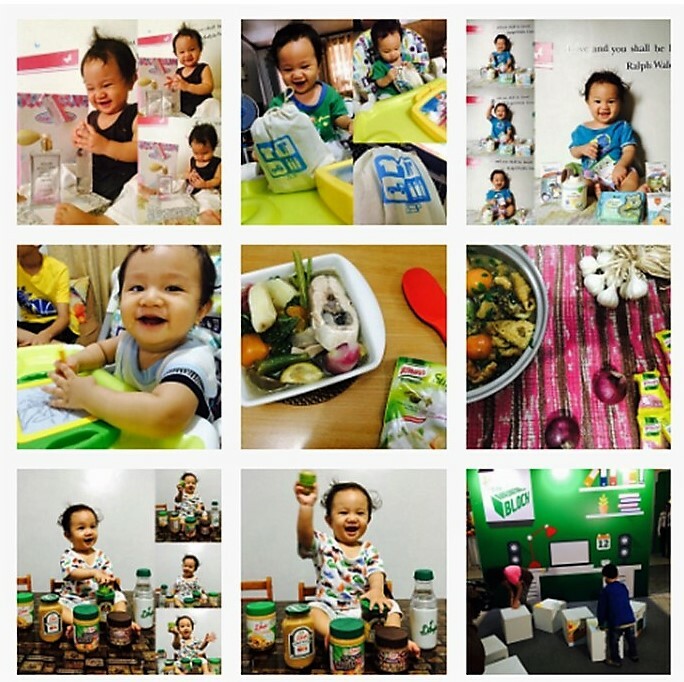 Momi Berlin blogging journey| Just a few of the brands we were able to try, review, and share with our readers. That I believe is the beauty of blogging. Through Momi Berlin, we get to pay forward. We can share products and services we have tried through product reviews. As a mother, I love to share tricks and tips that worked best in our household to manage the boys, our meals and anything we love to share. Through the readers’ comments, we get to know they appreciate those tips. We would also receive private messages from friends and strangers on how we were able to help them. Blogging is a part of my life now. As I have mentioned, Momi Berlin is now my baby. I will nurture it the same way I take care of my family. I hope you will always be there to support Momi Berlin and never tire of making it a habit to read a post or two. By the way, thank you as well. Hello.. this is the great post.. thanx for this valuable post. is there any short way? Loved reading your story. I find inspiring to understand how and why each blogger started their journey. For me, as I stated in my latest post, was about sharing my passions and aspirations. It’s really cool how you talked about everything, including WordPress! Hi! Congratulations on your first year! You’ve accomplished quite a lot and I’m sure you’re very proud of them – as you should! We started out the same way, actually. I just wanted to log my day as something I could look back to (like a diary) but when I discovered the other side of blogging, everything just changed for me too. 🙂 Thank you for continuing your blogging journey as you’ve been very helpful on your reviews and posts. Congrats! Your Blogging Journey has been very positive and fulfilling it seems. You had great mentors with very good advice. But good advice is nothing if the receiver doesn’t implement it. You have done very well, keep it up! What a journey it has been! I thought your blog has been up for years. It’s a surprise on how young your blog is. Congratulations on a wonderful, one-of-a-kind milestone, Momi B. And, thank you so much for the tip. I need that Copyproof plug-in. Has it only been a year?! It was great to be part of your journey, bumping into you in one of those blogging events we were able to attend together! I agree that our blogs are more like our babies, and it is amazing that we receive so many blessings through them, including opportunities to earn, constantly learn, and hopefully, inspire and help others, too! It is also a great blessing to meet wonderful and generous people through our blogs! More power to you and your blog, Mum Berlin, and cheers to more years of blogging fun! It is nice to read about your blogging journey.I started as a blogspot blog and it is for my recipes.Later,I expanded my blogs.Now,I am really happy about being a blogger!That’s really an interesting way to connect with people. Congratulations. It must feel great. I completely agree on this. WordPress and yoast seo plugin have helped me a in my journey. You sketched your first year as a blogger so vividly that I actually followed you step by step while reading the post. And I felt happy for you, for people who have helped you and for people whom you have helped. I wish you luck and many successful years in influencing your followers. Such an amazing journey Mommy Berlin and Im sure it does not end there. I have been blogging for quiet some time now and I really can attest the great perks of being a blogger. It was interesting reading about your blogging journey. It reminded me of mine in some ways. I think SEO is important, but I can’t write in short sentences even if they are easier to read. My writing is dramatic and I like it that way. It’s nice to see how you’ve started blogging without thinking any ROI (return of investment). Also, I like how you keep your blog active despite the years have rolled. I hope to be bale to manage such thing in the years to come. I know nothing is impossible but I just hope I can really make it. I think that the most successful blogs are the ones that start as a hobby. As long as you’re passionate to help and inspire others, you will find your readers. I’m happy that all turned out great for you and that your blog grew so much in a year! Best of luck on the years to come!